Last year I saved a photo of a tunic style shirt on Pinterest but I couldn’t find any reference to who the pattern was by. Then I came across the Cheyenne Tunic by Hey June Handmade and it looked a perfect pattern match! I didn’t have much knowledge or experience of sewing with Indie patterns, so when I saw a sewing magazine offering McCalls 7094, a free tunic pattern I opted for that instead. Big mistake, I hated it, despite making a small it was huge, as wide as it was long I think! Even after taking inches in each side I just didn’t like it on, I did wear the top a few times, more out of obligation for having spent time and money on it, but I’ve since taken the buttons off and it’s in the scrap pile now never to be worn again. This year when I was putting together my Make Nine list, I remembered this tunic and was determined to make the version I had originally pinned. I had an email early in January from Indie Sew with a list of their most popular patterns in 2017 and the Cheyenne was number 7 on this list, and with a limited 15% discount, that was the prompt I needed to add it to my Make Nine. 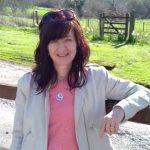 Shortly after Indie Sew announced that January was #shirtmonth, an online sewing event focussing just on shirts, so if you were planning on sewing a shirt this year, then this was the month to do it! 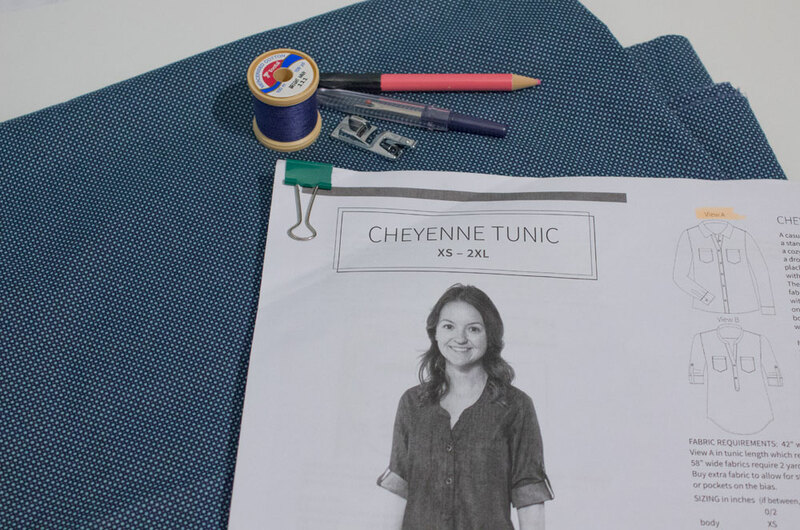 The Cheyenne pattern jumped to number one in the sewing queue! Although I had bought the pattern for the version above, there are actually two views, the tunic and a casual shirt, bonus! 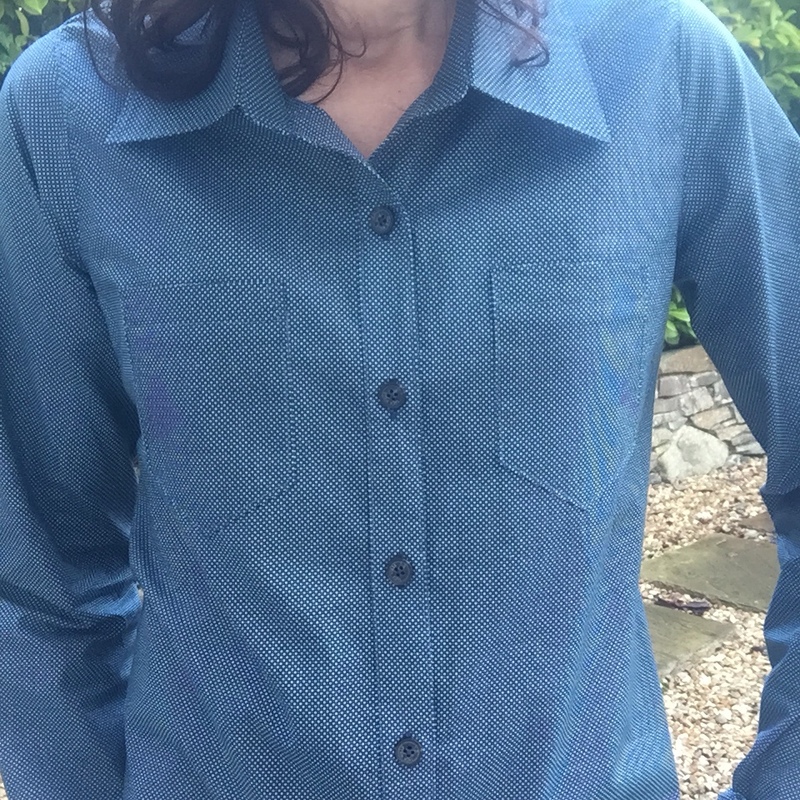 As I had made the McCalls tunic, I thought I’d give the shirt a go first as this was something I had not sewn before and as we’re in cold, wet January, the shirt would probably be more wearable than the tunic. Like many sewing friends, we all seem to be starting the new year stashbusting and I had bought 2m of this blue cotton fabric with little mint green dots last spring with a view to making some sort of top with it, so it was perfect. Fabric came from Fabricland in Southampton, I get to go there a couple of times a year when visiting family, it’s well stocked and has some really cheap but quality fabrics, I tend to slope off for a mad half hour dash grabbing whatever catches my eye and hoping I’ll not regret it when I get home! I have to admit, I quite like pdf patterns, yes I know it’s a chore to trim and stick but you can buy, print, assemble and have them cut out ready to go in next to no time, no waiting on the postal service and I prefer having patterns on proper paper rather than that brown flimsy tissue! This pdf pattern is great in that the sheets can be assembled in segments so you don’t have the whole unmanageble A4 sheets to contend with in one go. 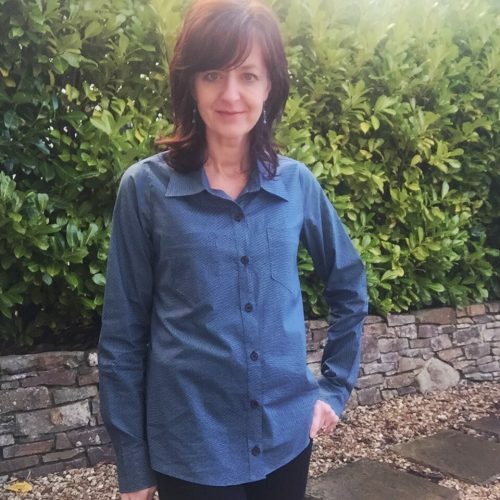 I decided to go for the XS, I wanted the shirt to be quite fitted in style and weary of the McCalls tunic sizing issue, I went down a size from the S that I would normally make. My bust and hip measurements just fitted into the XS sizing (let’s ignore my waist measurements…!) so I thought it should fit ok and thankfully it does! 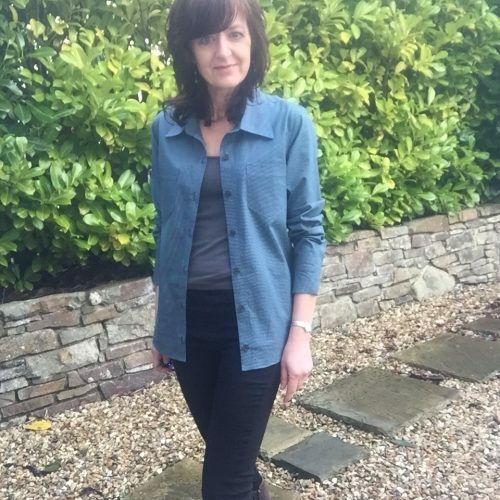 I’ve spent the best part of a week making this shirt and followed Adrianna’s Sew Along on the Hey June Patterns website, which was fantastic. It’s 6 days in total (Day 6 being an extra tutorial for the long sleeved shirt) and made everything so much clearer being able to visualise what was happening. The collar and stand I did spend a long time on this, I’d done collar stands before and had made my little boy a shirt in the past with just a collar so this was the first time putting both together. Along with the sew along, I used the collar tutorial by Four Square Walls which is excellent and worth bookmarking if you haven’t already. I decided to use my narrow hem foot for the curved hem, I had never used it before and it took ages to get it to work properly. I watched several You Tube tutorials, practiced, sewed and unpicked etc, the time I spent I could have just sewed it normally in a fraction of the time but where’s the fun in that! Next time I have a narrow hem, I’ll be reaching for the hemmer foot, it did make light of the hem once I’d got the hang of it. Not too much thankfully! I had never sewn French seams on sleeve heads before and I somehow managed to have excess fabric at the sleeve head on one of my sleeves. In my efforts to sort this out in the incorrect manner, (I should’ve unpicked it and started again), I made everything worse by trying to pull the excess into the seam allowance and sew it again. I also didn’t trim the first seam enough on the other sleeve and had the raw edge sticking out in places leading me to sew the seam again to try and catch it, so I had a larger seam allowance and I think the seams should sit a little lower at the shoulder for next time. 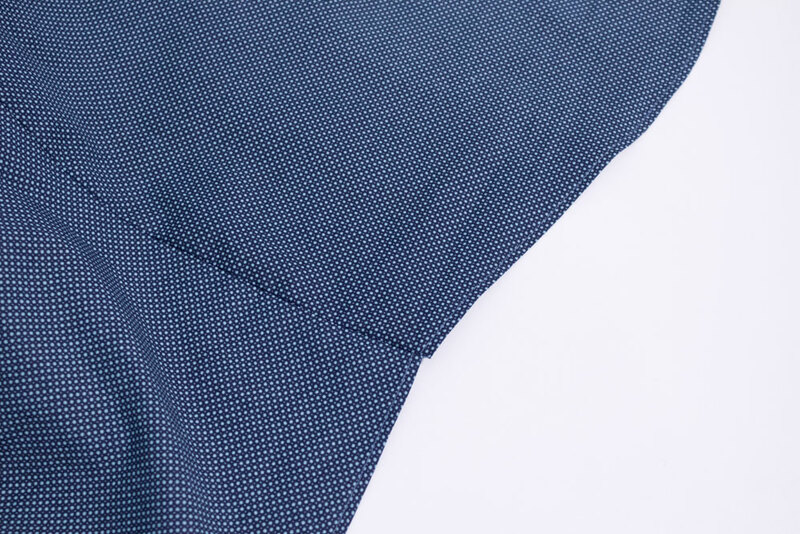 The curved hem does not meet exactly at the side seam. 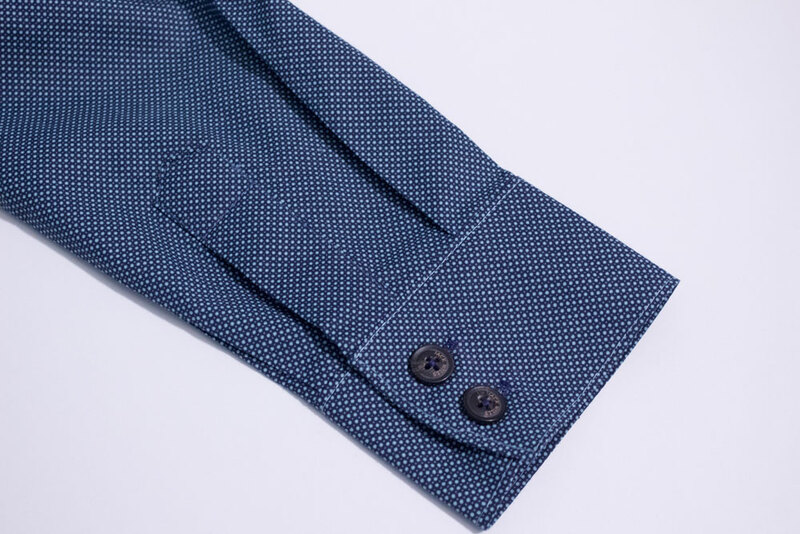 The instructions tell you to hem the shirt first, so to do the back and the two fronts separately and then sew the side seams. The only issue with me is that my hemming wasn’t precise on the back and front sections so when I sewed the side seams you can see they don’t quite meet at the bottom, it’s hardly that noticeable I know! Like, love or hate it? I love it! The shirt is a perfect fit, I made no adjustments and will definitely want to make this again. 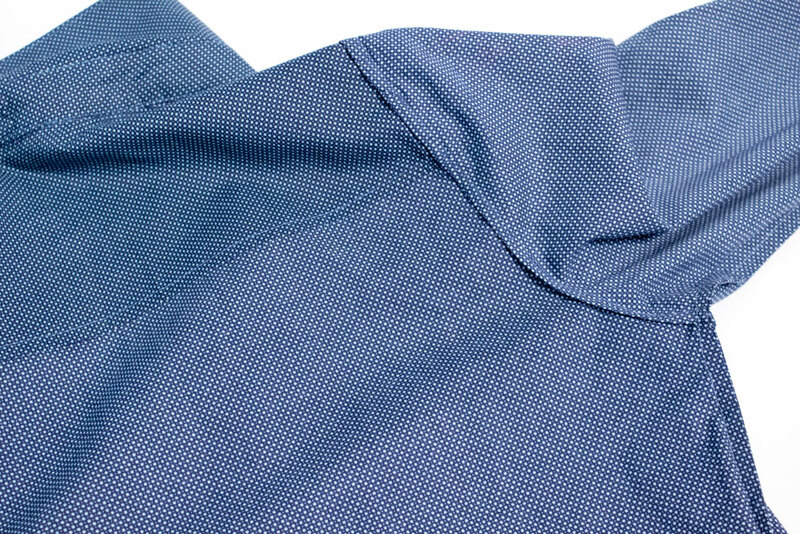 To speed up the making, I might consider using the overlocker instead of french seams but then I do love how neat the shirt looks on the inside so it’s probably worth the extra time to do this to get such a professional result! 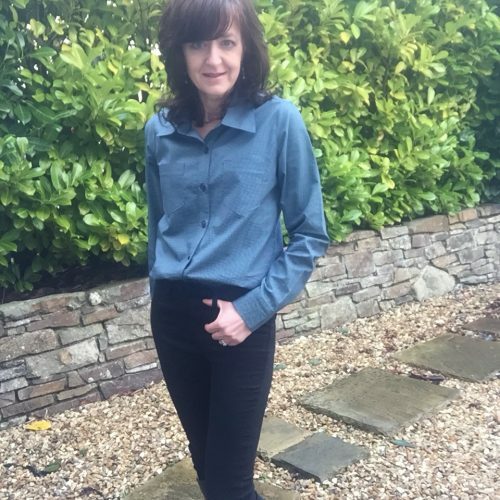 The shirt is both smart and casual, and can be styled in many ways, it’s really versatile and I think it will be a wardrobe staple for me. I have some white cotton which will be perfect for another shirt or the tunic. Overall the pattern is great, the instructions are really clear, the pieces all fitted together pefectly, there’s the photo Sew Along plus a Hey June Facebook group where you can ask advice on projects so plenty of help out there if you get stuck. 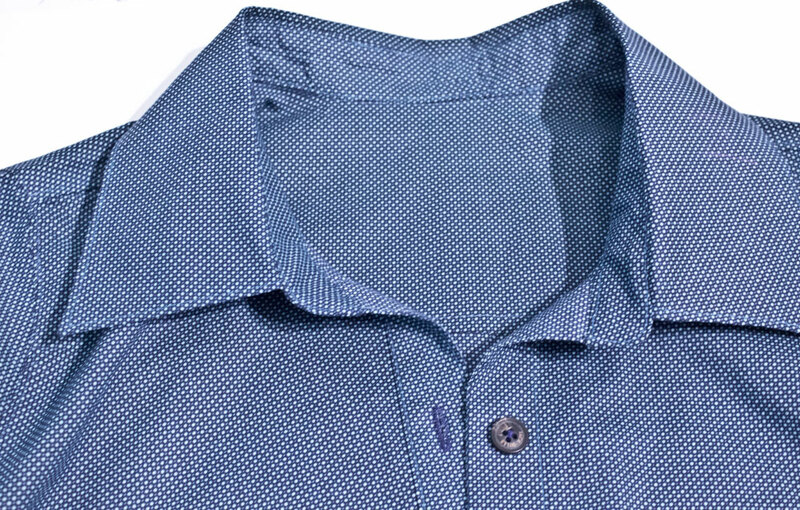 I would definitely recommend this pattern if you’re looking for a basic fitted shirt. This was a slow sew for me, at least 20 hours if not more in total I would say! I think I’m going to alternate weeks and have a week of sewing longer (woven) projects and taking the time to learn new techniques followed by a week of fast sewing with knits! This was my first make of #2018MakeNine, next in the sewing queue is the Seamwork Elmira cardigan and the Valentine & Stitch Cassandra dress, both knits so hopefully quicker sews! This entry was posted in Cheyenne Tunic, Dressmaking, Hey June Patterns, Pattern Review, Sewing. Tagged #2018makenine, cheyenne tunic, hey june patterns, pattern review. It looks lovely Max, and well wroth the 20 hours to have such a beautiful piece! If you don’t like doing French seams on the armscyes you could try felled seams? I do those on men’s shirts and they’re pretty simple but look really nice. In any case, next time you make the pattern everything will be so much easier and quicker now you’ve done it once before! Thank you sooooo much for drawing this pattern to my attention! I love it! You’ve done a great job with it. Looking forward to seeing your white version 😉 Out of interest, did you sew the French seamed sleeves in the flat? REALLY interested to see your V&S Cassandra too! !